Have you seen a sunrise in the Reno or Tahoe area that you didn’t like? Whether waking up early to purposefully catch the sun rising, or being up already for work and catching it on my way in, I don’t think I’ve ever seen a sunrise in this area that wasn’t something to stop and look at. I never used to be an early riser. I signed up for class at 10:15 every semester, I hated having to wake up early in high school, and if someone asked me to meet them somewhere before the sun was up I would laugh. The first really cool sunrise I remember seeing was in high school because our soccer team had to leave at about 5:30am for a game in Elko that same day. We were driving through Reno on the day of the Reno Hot Air Balloon Races and to see the sun rising over our eastern mountains and hitting the balloons on the clear morning was memorable. Since, I have changed my ways. I intentionally wake up a couple of times each year to watch the sunrise in a peaceful place. I am even lucky enough (not really) to work a 7am shift at my work, so now I get to see the sunrise almost every morning. The first time I decided to intentionally watch the sunrise was with my girlfriend after Christmas a year ago. We drove from Gardnerville up to Emerald Bay in Lake Tahoe early in the morning. We were lucky to catch one of the best sunrises I have ever seen. Sunrises can mean many things to many people. I love the colors that are reflected in the sky just before the sun is about to rise. I physically like feeling the heat of the sun on my face as it rises over the mountain. I also enjoy watching the sun’s light creep across the landscape that I am watching it from as it rises up higher into the sky. Personally, it is a good time for me to reflect. Because the sun rises slowly, when I am sitting there taking in the details I am also able to think with a clear, open mind. I will meditate on my physical body, or really think about my current life situation and what I am doing. Or I’ll think of ways to slow my life down, and make clear what I’m doing, because so frequently I am doing too much at one time. 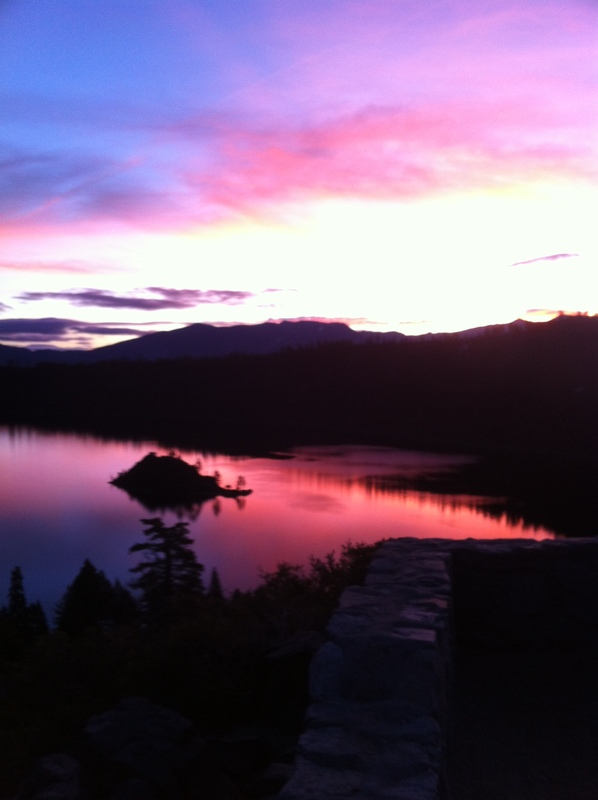 Lake Tahoe is an excellent place to see the sunrise, and so is Reno, so I recommend you try this just once. Set aside one morning, wake up early, go to peacefully place and watch the sunrise. Whether you enjoy the visual appealing beauty or the time it gives you to reflect, see what happens, I’m willing to bet you won’t regret it! If you have a favorite place to watch the sunrise, please share it here! This entry was posted in Uncategorized and tagged early, Lake Tahoe, sunrise, wake up on March 31, 2013 by joshvega.